LOUISA, KY — Lawrence Co. ( 14-6 ) vaulted it’s way to the #1 seed in 58th District action with a 69-41 thumping of Betsy Layne Tuesday at Home. The Dawgs can wrap up the top seed with a win Friday against Prestonsburg at home. Cody Maynard has put up 59 points in the last three games. The Dawgs led 17-6 after one period and 30-15 at halftime and cruised to the victory hitting 11 three pointers and completed the season sweep of the Bobcats. Cody Maynard hit 4 three pointers and finished with 17 points, Tyler Maynard tallied 15 points, Alex Ratliff netted 9 points, Chase Sartin finished with 8 points, Trenton Adkins hit 2 three pointers for 6 points, Noah Fairchild and Baden Gillispie had 4 points each, CJ Fairchild and Jacob Savage had 3 points apiece. LCHS went 8-14 from the line. LOUISA, KY. — In a big 58th District matchup it was Lawrence Co. ( 13-6 ) rolling over Floyd Central 75-54 Friday night at the Dawg House. Lawrence Co. jumped all over the Jaguars 27-14 in the first quarter as Tyler Maynard poured in 16 points. The Dawgs led 33-24 at halftime and broke the game wide open with another 27 point outburst to put the game away. 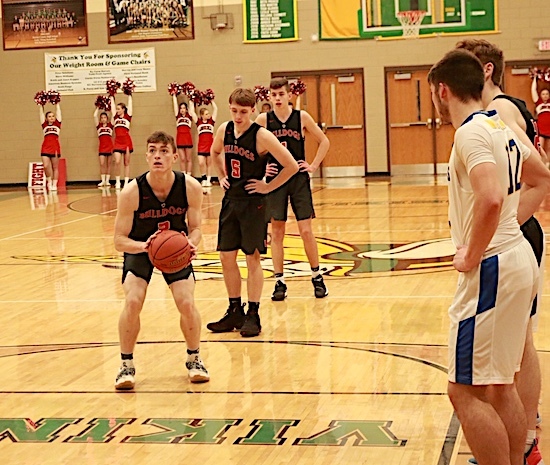 Maynard led the Dawgs with 21 points, Cody Maynard tallied 18 points, Chase Sartin netted 14 points, Noah Fairchild 6 points, Baden Gillispie and CJ Fairchild had 5 points each, Alex Ratliff 3 points and Trenton Adkins 2 points. Tyler Maynard eyeing the free throw in a recent game. LCHS hit 8 three pointers and went 13-19 from the line. FLEMINGSBURG, KY. — In the Coach Lake Kelly Classic the Bulldogs fell to a good Buckhorn ( 14-6 ) team out of the 14th Region Saturday afternoon at Fleming Co. High School. Cody Maynard poured in 24 points to lead the Bulldogs, Tyler Maynard tallied 16 points. Chase Sartin had 11 points, Noah Fairchild 8 points and Alex Ratliff 7 points. The Bulldogs will return to action with a huge District game with Prestonsburg in a Girl/Boy Doubleheader and then Saturday night at 7:00 against Tolsia. 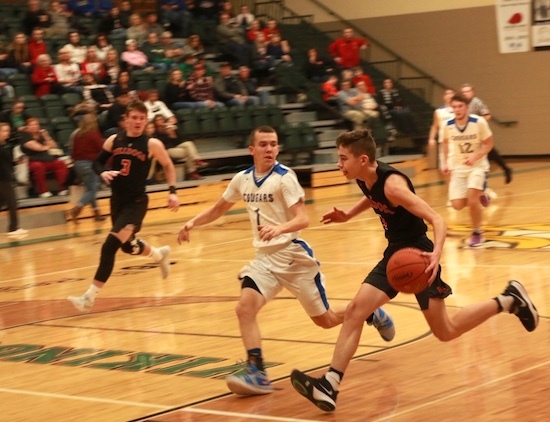 “… Played well against Floyd Central, great team win. Really played great defense. Then the next day on a short turn around we went to Fleming County and played against Buckhorn. We came out very flat and committed a lot of turnovers. We got beat off the dribble then because of bad rotations we gave up open three pointers.